Along with brushing twice daily, it is imperative to floss at least once a day to clean between your teeth and just under the gumline. Food and plaque can build up over time and damage your teeth and gums. While brushing your teeth can help, the only thing that will fight interdental food and plaque is flossing. According to the American Dental Association, it doesn’t matter whether you floss before or after brushing, just as long as you actually do it every day. Floss comes in a number of forms, but is typically a wax-coated string that is used to remove food and plaque from hard-to-reach places, like between the teeth and under the gumline. To floss properly, gently slide the floss up and down between teeth and around each tooth to gently scrape around the tooth and above and below the gumline. 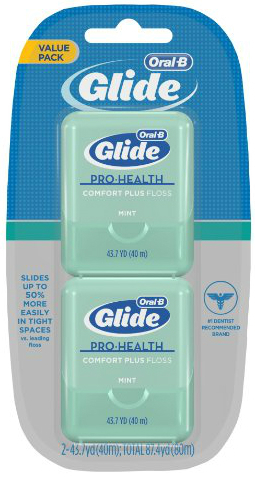 As Amazon’s #1 best seller in dental floss, you can be confident that the Oral-B Glide Pro-Health Comfort Plus Mint Flavor Floss will get the job done right. The unique texture makes it up to 50% easier to slide into tight spaces, while remaining gentle on the gums. It also contains a light coating of natural wax, which helps improve grip. The smooth, shred-resistant floss is gentle, but will effectively remove plaque between teeth and just below the gumline. Over time, this will help prevent gingivitis. The minty flavor will also leave your breath smelling fresh. This twin pack is one of the “most wished for” items on Amazon and has outstanding online reviews. It is also backed by a satisfaction guarantee. Oral-B is the #1 dentist and hygienist recommended brand worldwide and is the brand that most dentists use themselves. If you need a dependable toothbrush as well, consider the Oral-B Pro-Health Clinical Pro-Flex Medium Toothbrush. 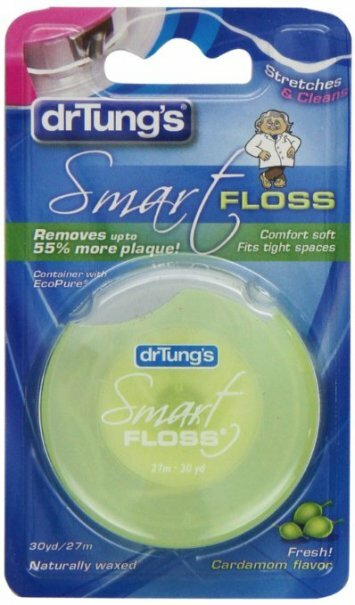 The Dr. Tung's Smart Floss stretches to clean better and remove more plaque. In fact, it is clinically proven to remove up to 55% more plaque. The comfort soft floss expands into tight interdental spaces to cover more surface area for superior cleaning. It has a natural plant and bees wax coating, as well as a natural cardamom flavor for fresher breath. It is gentle on gums and softer on fingers. You’ll be able to tell the difference with this unique floss right away. The 30 yards of floss is frequently recommended by dental professionals and has outstanding reviews from independent review sites. It is also ideal for those with braces and wide spaces in the mouth. 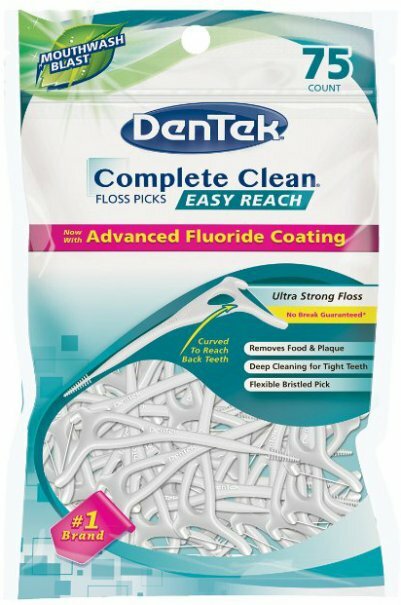 The DenTek Complete Clean Easy Reach Floss Picks consist of a break-proof, silky smooth scrubbing floss combined with a flexible bristled pick on the end. This allows you to clean even the crowded back teeth with ease, while still protecting your sensitive gums. The extended handle is easy to hold and reaches the back teeth, tight teeth, and sensitive gums with no problem. The angled head allows you to easily clean hard-to-reach places. The triangulated textured flosser brushes deep between the teeth to remove more food and plaque, reduce the chance of tooth decay, and provide a better clean. You simply place the pick between the teeth and gently press against the gum using an in and out motion to gently remove food particles and stimulate the gums. The cool mint flavor of the advanced fluoride-coated floss can fight bad breath and leave your mouth feeling fresh. This is easier to use than traditional floss, but is clinically proven to be just as effective. It is an Amazon best seller and is a popular favorite. It comes in 75 and 125 count, so that you can easily floss after every meal. Many reviewers also found that this works great for their kids as well. 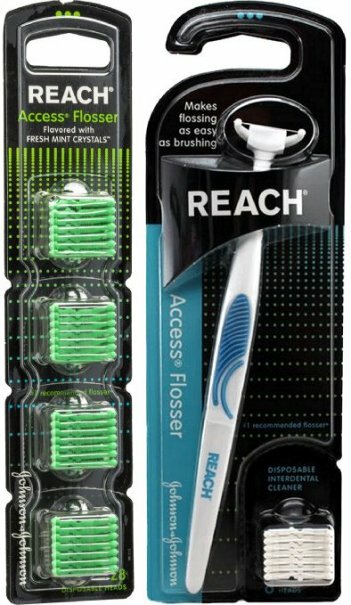 The Reach Access Flosser is the #1 recommended flosser among dental professionals, so you know it’s bound to work well. It makes it just as easy to floss as it is to brush, so even non-flossers are bound to like this. It can effectively clean all hard-to-reach places with ease. Thanks to the long handle, even people with large hands and those who find it difficult to floss properly have no problems with this. The disposable heads easily snap on and off, so you can stay hygienic with minimal effort. The flosser comes with eight additional mint floss heads, and there is another bonus set of 28 disposable heads attached, for a total of 36 disposable heads. It has outstanding reviews online and is beloved by non-flossers. The colors may vary, so you won’t be able to choose. If you prefer traditional floss, consider the affordable, bestselling Reach Mint Waxed Dental Floss. As Amazon’s #1 best seller in personal orthodontic supplies, the Oral-B Glide Pro-Health Threader Floss is ideal for anyone with bridges, implants, braces, or permanent retainers. It combines strong floss with a built-in stiffened threader tip to effectively floss under and around orthodontic appliances. The smooth, shred-resistant floss allows it to easily slide in between tight spaces to effectively remove plaque and food particles in between the teeth and just below the gumline. It is a much simpler solution than using a separate threader and floss. Oral-B is the #1 dentist and hygienist recommended brand worldwide and is the brand that most dentists use themselves. This 30-count of single-use packets is an Amazon best seller and has outstanding online reviews, particularly from those with braces and tricky permanent retainers. It is also backed by a satisfaction guarantee. If you need a dependable toothbrush as well, consider the Oral-B Pro-Health Clinical Pro-Flex Medium Toothbrush. 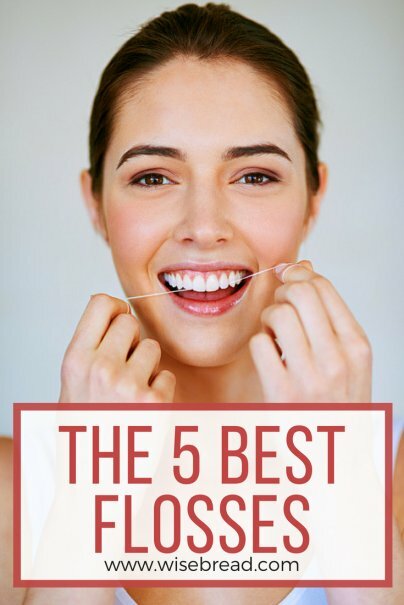 And those are our recommendations for the best floss. As always, be sure to check Wise Bread's Buying Calendar to learn when and how to buy just about anything!